This podcast features recorded audio from a videoconference by Vinnie Vrotny (@vvrotny) on May 12, 2016. His presentation was part of a 4 hour workshop at Casady School in Oklahoma City on "Visioning the Future of Computer Science and STEM Education in K-12 Schools." Vinnie discussed his experiences as a teacher and director working in Chicago-area and Houston-area independent schools helping develop updated computer science / digital literacy courses, curricula, and STEM / MakerSpace learning spaces for students as well as teachers. The podcast concludes with an audio reflection recorded by participants at the end of the workshop, sharing some of the key takeaways and learning points from the day. In addition to teachers and staff from Casady School, we were also joined by several community representatives from higher education (Rose State) as well as a local software design company (iThemes) during this workshop. 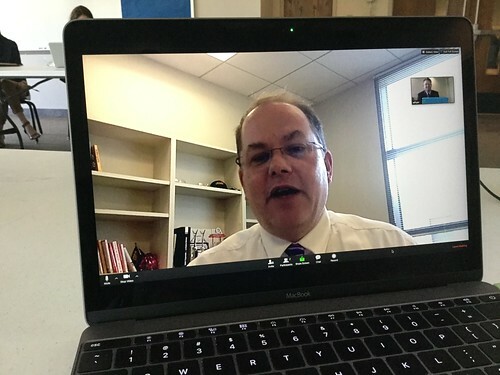 Many thanks to Vinnie for sharing his experiences, perspectives, and advice to assist our faculty and staff as we work to envision a future program of computer science and STEM learning at Casady School. This podcast was originally posted on STEM.casady.org and cross-posted to STEMseeds.org. Refer to the podcast shownotes for referenced resources and links from the presentation.